It used to be that municipal and government buildings were designed and constructed with a sense of magisterial pride, with shapes and materials expressing the values of democracy in stone. Then came the 1970s, ’80s and ’90s, when the desire for economy and functionality often led to buildings that could have been easily mistaken for insurance offices. There was Attleboro City Hall, for instance, a two-story, flat-roofed box with a glassed-in foyer and peaked roof tower covering a staircase. Inside, upper-floor hallways seem scarcely wide enough for two people to pass at once. Some of the building’s current features reflect a more recent rebuild to remove a courtyard and correct various problems. North Attleboro’s gray town hall, while containing a generous, glass-fronted atrium, resembles nothing so much as a ship run aground. Over the past several years, however, municipal architecture seems to have changed. Glass boxes are mostly out. Brick or wooden clapboard exteriors are in, as are traditional-looking columns and peaked roofs. Hallways and staircases are becoming wider and easier to navigate, and interiors more inviting with brighter lighting and increased use of stone and masonry for floors. “Actually, the traditional style of architecture has always been there where design has been used to fit the existing architecture of a particular town,” said Michael McKeon of Kaestle Boos Architects, whose firm has designed a number of municipal structures. But McKeon said there has been a greater recognition lately of town hall and other municipal buildings as symbols of the localities that built them and the residents who use them. That, in turn, has led to a greater consciousness of how town-owned buildings look as well as function. “There really has been a return to the value of materials and a return to the permanence of municipal architecture,” he said. From town halls in Norfolk and Wrentham to a fire station in Attleboro, appearance is once again accentuated along with functionality. The latest example is the new town hall in Foxboro, a traditional-looking, two-story brick colonial structure accented by a quartet of Monticello-like columns at its peaked front. Besides its historic-looking appearance, the building was designed with large windows, wide stairs and hallways, and high ceilings in public spaces that provide an air of openness. And generous use of wooden panels in the building’s main meeting room adds a feeling of solemnity. Both the inside and outside of the building reflect the wishes and character of the town and those who commissioned it. “From the beginning, the town wanted a colonial building,” said R. Drayton Fair of LLB architects, who created the town hall’s design. Town officials and the needs of municipal departments dictated the basic theme of the building. It was up to the architect and the volunteer building committee to come up with a town hall that would fit those needs in a way that matched the town’s personality. Fair said the building’s execution, while in many ways symbolic, was driven by practical, and not just design, considerations. Rows of high, insulated windows on the exterior were intended to provide as much natural light as possible for employees, he said. And wide hallways were provided to welcome residents and visitors and ease access to various offices and meeting rooms. Both contribute to a theme of openness. Despite the historic appearance, some modern construction materials were used where traditional ones would have been too expensive or not lasted as long. The two-story-high columns aren’t stone or wood, Fair said. They’re made of Fiberglas. “We tried to build something that would be durable, lasting with a look that would stand the test of time,” said Bill Yukna, chairman of the town hall building committee. 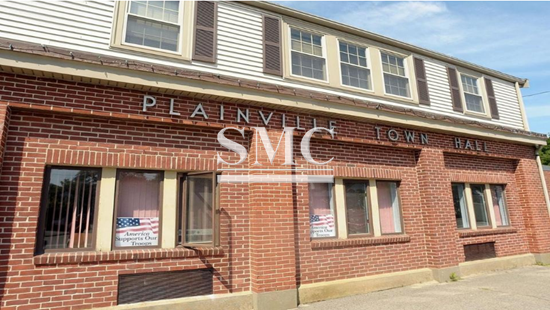 A return to traditional architecture is also reflected in buildings in other area communities, from the columned town hall in Norfolk to the town hall and public safety building under construction in Plainville. The care being taken in designing public structures locally reflects a nationwide reinvestment in municipal architecture, Matt Tinder of the American Institute of Architects said. “In the 1980s, municipalities didn’t have a lot of money to invest in public projects,” Tinder said, and the result was that many were downsized or built on the cheap. “Now there’s a greater emphasis on investment in public architecture across the country, in creating public spaces that will last the community for many years,” he said. Not everyone takes to the idea of spending on public infrastructure. When Attleboro built a new fire station in 2000, some criticized it as a “Taj Mahal,” longtime municipal building committee member Jack Jacobi recalled. The four-bay structure with attached offices has a traditional look. Its hose tower, attractive brick and granite work and peaked roofs in many ways recall a 19th century firehouse. But each of the building’s features was built to fulfill the fire department’s needs, not to impress, Jacobi said. The fact that it looks good is a bonus. One of the major features of the firehouse are front and rear access doors that let fire trucks drive through the station rather than be forced to back in. “Can you picture a ladder truck backing into the station from Route 123?” Jacobi said. Much of that form-follows-function ethos is reflected in designs for the proposed new Attleboro High School. The contemporary design blends new and traditional materials so that the building will be compatible with the nearby Studley Elementary and Brennan Middle schools.